John Kramer’s paintings bring to mind long, hot, lonely Sunday afternoons in the platteland. The images of slightly dilapidated buildings are both achingly familiar and strangely foreign. Inevitably they evoke feelings that hover somewhere between warm comforts and quiet despair. 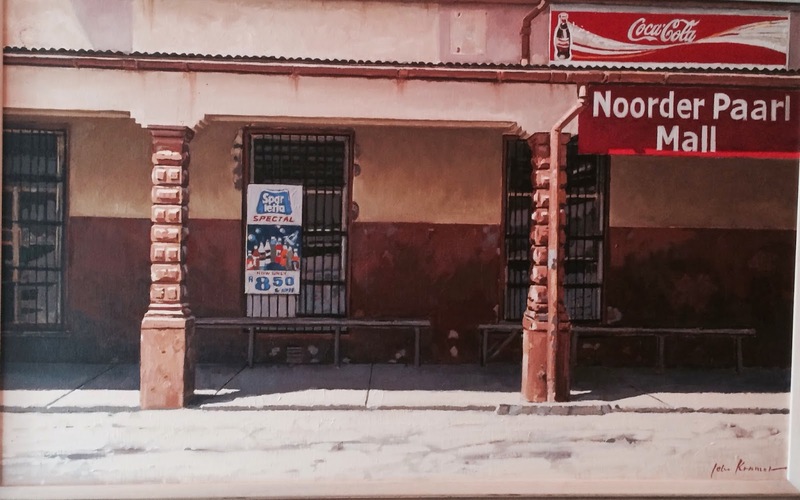 John Kramer’s paintings portray the everyday ordinariness of our country. Old buildings and corner cafés embody the spirit of a community and times that has almost been erased from our memory. He paints with compassion and affection, affection, I suppose, born out of a familiarity with the scenes he paints. He explains, ‘It helps to paint what you understand. I’m not saying I completely understand these communities, know exactly how a shop is run or who the owner is, but I certainly understand or can relate to the scenes I paint. I can recall those quiet, boring Sunday afternoons. I’ve sat under verandas in small towns as a child, wishing something exciting would happen. I remember those moods and remember hating it. There is something melancholic about these paintings but still they manage to celebrate the very ordinariness of that society has begun to reject. It is no wonder that his works are highly sought after by South Africans living abroad. Looking at them, you can almost hear the call of the cicadas and smell the small town dust. 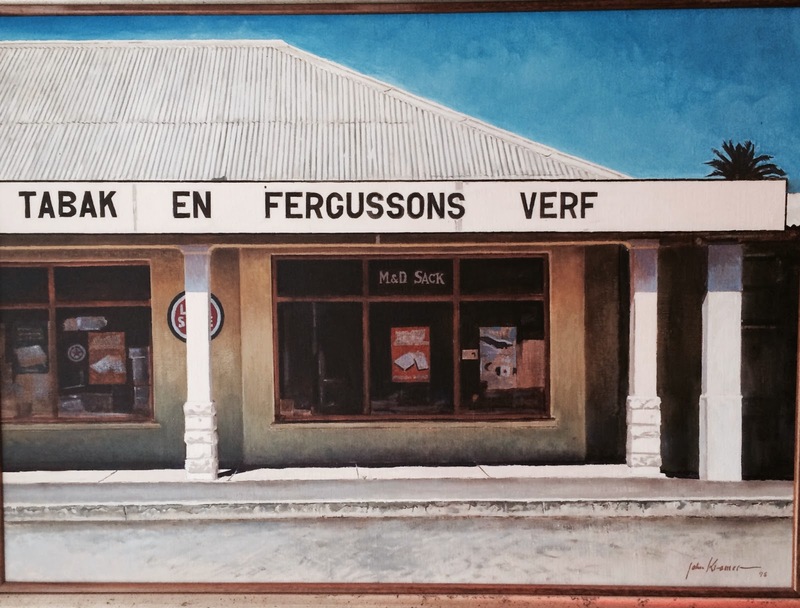 For some it is the Afrikaans lettering on the buildings that remind homesick South Africans of their heartland. But it isn’t only the images of the platteland which conjures up memories. 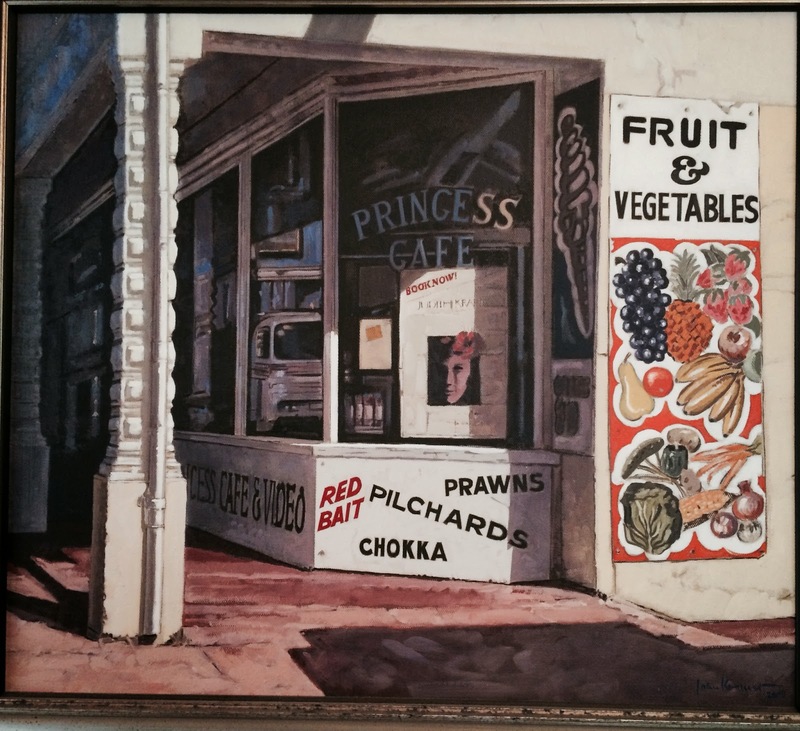 John’s body of work depicting the corner cafés awaken a long forgotten suburban memory of old chocolates, glass jars filled with loose sweets, brown paper packets and magazine racks where Scope magazines were furtively read by schoolboys behind the trays of warm government loaves of bread. The demise of the suburban corner café almost caught John unawares. ‘I never worried too much about the corner cafés until one day I realised they were almost all being replaced by franchised cafés. I don’t think any of us could have imagined how fast they would have disappeared in the past 10 years. These are real losses and I’m glad that I managed to capture some of them.’ The Imperial Café with its corrugated iron roof and wooden structure was a Cape landmark; nestling underneath the incomplete flyover at the entrance to the Waterfront. It was a source of irritation to some but a source of joy to others. It burnt down a year or two ago, but John’s painting managed to capture the mood of this late night convenience café. Then there was the exotically named Zanzibar Café in Voortrekker Road. It was one of John’s favourites reminding him of the legendary Baghdad Café (of the film of the same name) where anything may happen. I remember the Onrus Cash Store. It now longer exists, but then much has changed in this small seaside village near Hermanus. Looking at a painting of it, I’m transported back to cold wet Cape winter weekends in a village with few inhabitants, even fewer playmates and where a visit to Mrs Hen’s café would mean sticking your grubby hand into a jar filled with Apricot sweets, Wilson toffees and cheap peppermints. Hot summer days would necessitate a similar barefoot journey to but ice-lollies which then dripped orange syrup all over warm sunburnt arms. This is what John Kramer does best. He captures a moment in time. Driving through a town you may or may not notice the tin barrels converted into garbage cans, or the car tyres now used as a planter for the Mother-in-Law’s Tongue, or the windmills, or the short picket fences painted in oranges and browns, or the wire garden gates. It is only in a painting that our attention is focused on these details that convey the soul of a place. But for how long will these small towns continue to be an example of Real South Africa? John believes that their time has almost passed. ‘The slow demise of the railways has killed these places. With the railways pulling out of the towns, the economy collapsed and the Karoo fell apart far quicker than one would have imagined. The arrival of television also signaled the end of an era for small town South Africa. Suddenly the whole world was being beamed into everybody’s living room, including the people who lived in these small towns. For the first time they became aware of how the rest of the world lived and those fantastic naïve combinations of colour and whatever they did décor-wise that was perhaps regarded by those more sophisticated people as being in bad taste, disappeared. ‘And then of course city folk bought up houses for weekend homes. New designer colours appeared on the scene, new broekie-lace was put up and while the houses may now look lovely and small town appear on tourist maps, they’ve lost their authenticity and soul.